to reduce the federal deficit. The Congressional Budget Office has estimated that using the chained CPI to index Social Security and other federal programs would reduce federal spending by $182 billion through 2026. It would also increase the amount people pay in taxes as tax brackets and the standard deduction grow more slowly in coming years. 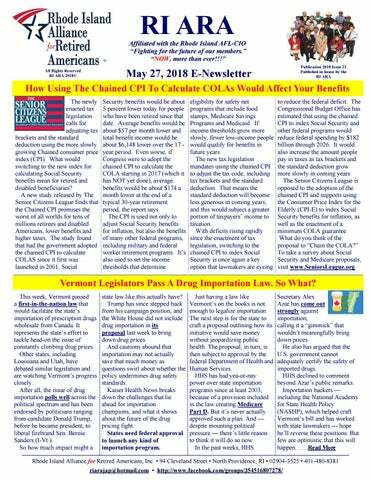 The Senior Citizens League is opposed to the adoption of the chained CPI and supports using the Consumer Price Index for the Elderly (CPI-E) to index Social Security benefits for inflation, as well as the enactment of a minimum COLA guarantee. What do you think of the proposal to “Chain the COLA?” To take a survey about Social Security and Medicare proposals, visit www.SeniorsLeague.org. state law like this actually have? Trump has since stepped back from his campaign position, and the White House did not include drug importation in its proposal last week to bring down drug prices. And cautions abound that importation may not actually save that much money as questions swirl about whether the policy undermines drug safety standards. Kaiser Health News breaks down the challenges that lie ahead for importation champions, and what it shows about the future of the drug pricing fight. States need federal approval to launch any kind of importation program. price of a 60-year-old antiinfective drug, Daraprim, from $13.50 to $750 per pill. Several of the world's largest drugmakers were cited by FDA as having refused to sell more than one medicine to generic companies, often drugs long on the market that generate billions in annual sales. Those include Switzerland's Novartis AG, cited for blocking access to four medicines, and Summit, New Jersey-based Celgene Corp., cited for blocking access to three drugs. Many of the drugs are for various cancers, HIV and heart disease… Novartis said in a statement that it "disagrees with the inclusion of our products on the list." The company said its drugs on the list have a generic version under FDA review. Celgene said generic versions of some of its drugs will reach the market "in coming years." reducing the impact of rebates in contracts between Part D plans and drug manufacturers and at the point of sale; and  Efforts to reduce out-ofpocket spending, including by providing more information to people with Medicare about lower-cost alternatives. While it is not yet clear how these broad goals will translate into actionable policy proposals, Medicare Rights supports efforts to improve the affordability of prescription drugs for people with Medicare. We look forward to reviewing the details of the Administration’s strategy and to working with policymakers to pursue meaningful solutions that lower costs for people with Medicare. Read our statement. prescription drug needs and their plan’s deductible and formulary tiering. However, the lack of this information makes the tool of very limited use for consumers. At Medicare Rights, we welcome a focus on transparency in the Medicare program and see the Dashboard as a step in the right direction for future actions that will reduce drug costs and increase the affordability of prescriptions for all. While the Dashboard tool cannot show which drugs are the best value, people with Medicare and others may find the information interesting and informative. Access the Drug Spending Dashboard. Judith Stein, executive director of the Center for Medicare Advocacy, noted, “These can literally be life and death decisions. CMS has a duty to provide complete, unbiased information to help beneficiaries make the best choice for their Medicare coverage. Regrettably, the current version of Medicare & You does not fully and fairly inform people of the pros and cons of Original Medicare vs. Medicare Advantage. The draft Handbook needs to be corrected before it is published and sent to beneficiaries.” Kevin Prindiville, Executive Director of Justice in Aging stated: “Several proposed changes in the Handbook distort basic facts about how Medicare Advantage and Original Medicare work. People with Medicare rely on Medicare & You for accurate and objective information. 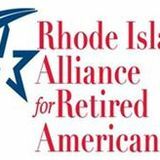 If these changes were adopted, beneficiaries would not have the information they need to make fully informed decisions about their Medicare coverage.” Read the letter here. exercising of their business talents. “Truth is, they’re doing nothing except extracting value and wealth from hard working people because they have economic advantages.” “With all this extra money they have, it corrupts our politics absolutely,” he continues. “It concentrates markets and makes them less competitive.” Ellison has become a frequent target for criticism from the Trump administration, including from the president himself….Read More Shared from Steve Murphy, Business Agent, RI IBEW 2323. This is being shared to show how corporations can pay executives exorbitant compensation, while holding back increases, health care and pension for employees. They seem to forget, without employees, they have no corporations, therefore, no executive salaries. Depression and Older Adults Depression is more than just feeling sad or blue. It is a common but serious mood disorder that needs treatment. It causes severe symptoms that affect how you feel, think, and handle daily activities, such as sleeping, eating, and working. When you have depression, you have trouble with daily life for weeks at a time. Doctors call this condition “depressive disorder” or “clinical depression.” Depression is a real illness. It is not a sign of a person’s weakness or a character flaw. You can’t “snap out of” clinical depression. Most people who experience depression need treatment to get better. Depression Is Not a Normal Part of Aging Depression is a common problem among older adults, but it is NOT a normal part of aging. In fact, studies show that most older adults feel satisfied with their lives, despite having more illnesses or physical problems. epidemiologist at Harvard's T.H. Chan School of Public Health in Boston. Rhee and her colleagues analyzed data from nearly 30 million Medicare beneficiaries who were discharged from U.S. hospitals from 2000 through 2012. Using ZIP codes, the investigators were able to calculate seniors' annual exposure to fine particulate matter, or PM2.5, in the air as well as to ozone from April through September. The researchers also developed models that allowed them to link pollution levels with hospitalizations due to ARDS. They found a significant link between changes in levels of fine particulate matter and ARDS admission rates among older people. exposed to pollution levels that were within National Ambient Air Quality Standards. The study's senior author, Dr. David Christiani, is a professor of environmental genetics at T.H. Chan School of Public Health….Read More More information The U.S. National Institute of Environmental Health Sciences has more about the health effects of air pollution. Note: EPA Director. Scott Pruitt & Trump want to relax regulations because they hurt corporations.